That's been tried, but the demand wasn't there. Folks now are looking at putting LS engines in their Vortec trucks. Maybe this will help. Are you sure the middle number isn't 150? Just wanting to confirm these numbers are right.. Both say the same.. But seems most of the charts out there are just copy and paste.. The ones on my truck flow 25 lb/hr @ 3 BAR/43.5 psi. That's actually measured and from the injector flow report. They were the stock marine injectors. Delphi EV6 units with USCAR connectors, IIRC they are rated at 24 lb/hr from the factory, but all mine flowed 25 lb/hr after cleaning and refurb. They would be for pre 2007 as my project was completed before 2007.
from some of the resources found here. I'll try and take a peak for the exact number from my injectors. Unbelievable, it's been 5 1/2 years since I got my marine intake and now it is finally on my truck. I know I'm like a decade late to the party since quite a few have sold their setups, trucks, or simply swapped in a 6.0 or better motor. It was a realy pain to swap and even more of a headache routing all the piping for the blower back on. I got the obvious codes like p0405 and p1345. The EGR I'll deal with either with a divorced setup or just a delete and block off plate all together. The p1345 was fun. I hooked up and saw 56° for timing but this was with a brand new billet distributor. After a few adjustments I got her to .5° and figured I'll leave it at that. The irritating one was p0200. I had cylinder misfire up on the scanner and didn't see any current ones while monitoring. I was gonna check history so I could track it down a bit but decided to call it a day. Also, when I try to give it some gas my truck stumbles and then increases in rpm. This could be related but also thought of my TB blade that I had modded when the truck was down. Lastly, I got some dripping below the truck and guess it is a fuel line. I'm not sure if it's the feed, return, or both. Have a question to all, why not to just install manifold from earlier Pontiac firebird or impala, the engines are L31, manifold should bolt right on, and less changes to make then with the marine intake...? Thanks in advance, and sorry if the question is dumb.. It is not that i have something against, it`s the opposite, I have a k1500 Chevy Silverado 5.7, with vortec heads installed and CSFI (spider injectors), and right now I`m in the middle of decision making, what to install on my truck.. Therefore, any suggestions and reasons why would be appreciated! As far as I understand it, the marine intake was to keep the oem look (important for some states) and to provide for injector upgrade and move away from the crapy CSFI injector system. Are you talking about the LT1 intake? I don't think those have a hole for the distributor and are reverse coolant flow, so the thermostat system should be different. I think he's talking about the old tune port intake, they make a vortec lower, you have several options today,ram jet , edelbrock pro flow, weiand stealth ram & I'm sure probably more , if you have emissions the marine is probably the only way to go! This $22 4 bolt upper plenum t-body to 3 bolt throttle body(which our Vortec 305/350 L30/31 trucks/vans/SUVs) use stock from the factory. As per "issue to Overcome" #25 in James B first post of this thread, you must space the throttlebody upwards in order to prevent the t-body arm from contacting the end of the passenger side fuel rail. And another picture of the t-body bolt pattern adapter on its own along with its supplied fastening hardware. I am not 100% sure that this adapter alone will provide sufficient clearance between the throttle body arm and the front portion of the fuel rail on the passenger side. Regardless a spacer could be used along with this adapter to provide both enough clearance AND the change in bolt pattern. There seems to be more and more Penta/Volvo and other upper plenums from the crossram L31 truck style that come with 4 bolt 75mm t-bodies. This adapter will allow these 4 bolt t-body uppers to be used along with stock L30/L31 3 bolt t-bodies found in our 1996+ vehicles. There are some 4 bolt cross ram style upper plenums for sale on their own on EBay. These adapters shold really help out us GMT-400 style vehicle owners looking to do the Marine Intake retrofit. I cant belive its been 12 years around this time where a concerted effort from certain folks here at PPE made this Marine Intake swap a reality. Hey man, its been a few months now. How is she holding up? Did you get all your finishing touches completed? So other than using larger injectors what is the purpose of this? Hp gains? Would a marine intake from a Mastercraft Indmar motor work on a L31? The throttle body attaches at the front of the upper vs. the top. Not sure what other differences there are. The short answer is "yes" it can work, but there are a bunch of other issues that will need to be overcome. The Vortec truck thermostat incorporates a radiator bypass function that allows coolant to continue to circulate and equalize temperatures throughout the block and heads without running it trough the radiator. 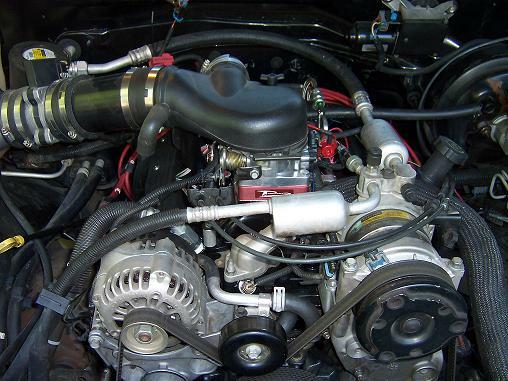 The Vortec cooling system is "parallel" where coolant flows through the heads gasket into the heads equally between all cylinders rather than a series circuit where coolant primarily flows around the cylinders in through the front of the block, then up through the passage at the back where it returns forward through the heads and into the intake manifold. The point of the whole system is to have fewer hot spots and make everything more even - and critical to that is fluid constantly moving. The Vortec crab distributor fits fine with these intakes - these motors ship that way. Not sure about fuel fittings but you can use the parts listed on page one to adapt the stock lines. The belt path appears to be a potential problem, plan on eliminating the stock idler pulley location and relocating with some custom brackets. All in all, that intake would be a better performing solution easily. The marine adaptation is intended for those who wish to retain OEM component compatibility, emissions, and even aftermarket part compatibility but also have standard fuel injectors. There are *much* better performing solutions available for Vortec heads. Want to also mention a Vortec 454 (L29) throttle body will work better for this because the cable is oriented to come from the bottom direction rather than the side. I am currently aquiring parts to go this direction. I will keep this thread posted to my progress. Im selling my intake. Time to go to an LS.